Everyone wants to grow their revenue. But to drive ever faster growth requires constant business and technical innovation. Innovative companies constantly push the boundaries of their infrastructure -- including payment gateways -- to expand into new geographies, markets, and business lines. Yet, the demands they place on their business are often constrained by the limitations of their technical infrastructures. One area of constraint for merchants is around the solutions they use to accept payments. Innovators require flexibility in these payments and e-commerce infrastructures. Siloed payments solutions may not suit or adapt well to the specific needs of merchants and marketplaces. As a result, an e-commerce company will either have their ambitions to grow into new markets limited or delayed. to support their unique and changing payments requirements. At the same time, fast-growth companies succeed by delivering a great customer experience. Customers that return and recommend a service demand more than just an average value. A vital part of that customer experience is the process of accepting payments. Declined transactions and long latency times for approvals can damage goodwill and reduce customers' lifetime value. Plus, the inability to accept payments in the way customers demand "or in the markets that customers are in" can lead to long latency times for approvals, or even the inability to accept payments in the way customers demand or all contribute to a damaged customer experience. To deliver a great customer experience requires reducing these false declines, cutting latency, and ensuring that customers can pay as they prefer. As we'll see in this eBook, that isn't always simple with a single gateway. As a result of these challenges, fast-growth companies connect their applications to multiple gateways to facilitate both business and technical innovation. Let‚Äôs take a look at several of the key reasons for using multiple payment gateways in more detail. e-Commerce continues to grow at a staggering pace. Analysts predict that by 2020 double-digit growth will bring sales online to $4 trillion per year. As this growth rises, more and more businesses will grow into new markets and build new business models. For instance, SeatGeek has evolved its model over time from directing purchasers of event tickets to ticket brokers sites for purchase to delivering a complete customer experience within their own solution. With support for more than one payment gateway, e-commerce services are able to introduce new and dynamic business models. For example, a delivery company aims to bring on thousands of restaurants and corner stores. But each of these merchants has its own payment provider. The delivery company not only can't integrate with each provider, it would rather provide differentiation by being able to make easy for new merchants to onboard by offering easy connections to whatever gateway the merchant uses. The need for more than one gateway is clear when your business expands ‚Äî particularly abroad. As you sell across countries, you'll notice varying levels of support. Some gateways may cite support for a particular country, but in fact their support may cover only certain payment methods and currencies. Or their ability to process transactions successfully and quickly is less compelling. This can be especially true for domestic versus international payments. By adding support for multiple payment gateways, an e-commerce service can route transactions to the gateway that provides the best support for a particular region. The result is more successful transactions across multiple markets. Using multiple gateways makes great business sense when you consider the flexibility it gives your team. As you work with a gateway in a particular region, you may discover that fees, contract requirements, and other business issues degrade the value you get from your relationship. By working with multiple gateways, you can readily shift your transactions to another partner as needed. There are many gateways available for merchants to use. And the unfortunate reality is that some of them won't be around in the long term. Storing card data outside of the gateway, or with a duplicate backup vault that is outside of the gateway, provides tremendous security and flexibility for your team to shift gateways if needed. More commonly, there might be a situation where the gateway simply goes down or is unresponsive. When that happens you can lose a tremendous amount of customer goodwill, not to mention revenue. But with multiple gateways on hand, you can efficiently re-route transactions through an alternative gateway with limited disruption. Another common scenario is when a merchant may have an exceptionally high volume of transactions. For instance, Spreedly customer The Shed manages ticketing for many of the world's largest festivals. When tickets go on sale, there is a massive influx of demand. Companies that have similar bursts of transactions want alternatives if a gateway can't handle the volume so that their on-sale can proceed smoothly. As the payments industry evolved, there were two kinds of providers. One that offered a combined gateway and merchant account. And others that were gateway-only. Merchants that wanted simplicity often chose the combined approach, despite what were generally higher transaction costs. While higher volume merchants that were comfortable with managing the process often would use their own merchant account and opt for the more cost-effective transaction fees. While both are valid options, there's a middle ground where both options are used by the merchant. For example, your business might have negotiated great processing rates from a provider, but you want the flexibility to work with the gateways that meet your specific needs. Or, you may simply want the option to move from one gateway to another without the hindrance of adding a merchant account when you switch. Part of providing a great customer experience is to offer payment options that your customers demand. An example of that is PayPal. As one of the world‚Äôs largest internet payment companies, many consumers have PayPal accounts and prefer to use PayPal rather than enter credit card details into yet another website. This same benefit can also be a downside. Having to click away from your checkout page to the PayPal site is a bad user experience which can depress sales. By using multiple gateways, this challenge can be avoided. Lyft, the ride-hailing app, uses one gateway for most transactions and another for customers who want to pay with PayPal. Even if you don't use PayPal as your main payment gateway you can still offer it as an alternative. At the same time, this approach provides an excellent backup in case your primary payment gateway or merchant account experiences problems. A merchant may have a preferred payment gateway that they want to work with because of preferential rates, or another business value. But that gateway might not offer all the services that they need. For instance, they might not support Level 2 or Level 3 metadata. Or they might lack 3DS support. As a result, it likely makes sense for business reasons to connect to the gateways that cover the use cases needed. Then, when Level 2 or 3DS support is needed, the merchant can simply redirect transactions to the gateway that supports their need. What Does the Data Tell Us About the Advantages of Multiple Payment Gateways? At Spreedly, we collect rich data on the success of transactions, payment methods, and gateways. We use the insight generated from that data to help our customers provide an even better customer experience. Our data science team analyzed tens of millions of transactions processed in conjunction with the Spreedly platform over the past six months. To understand how well the reality of multiple gateways compares with the business value we outlined above. First, let's look at general attributes of the data collected. 30% of the analyzed transactions were authorizations and 70% were purchases. The transactions were 90% domestic purchases and 10% international across all currencies. To be clear, a cardholder in Argentina transacting in Argentina Pesos would be classified as a domestic purchase for our analysis. A key recognition as we look at the data is that the gateway is only one part of the payment infrastructure. However, if we attempt to control for this, the data reveal important insights for merchants evaluating their gateway strategy. We assessed the results to determine confidence levels.Statistically speaking, we are reporting these results in 1% significance level. Now, let's look at the key conclusions drawn from this analysis. In addition to variability across currencies served by the gateways, there is also a significant difference in gateway performance based on transaction type. Decline rates when compared across gateways vary significantly when categorized by authorization versus purchase and domestic versus international transaction types are correlated with decline rates. The same holds true for latency levels. Our analysis highlights variability of transaction latency by gateways depending on the type of transaction. International coverage is not a guarantee when you pick your gateway. We found that the average gateways processes transactions successfully in six currencies. 50% of gateways analyzed transact in two currencies or less‚ in fact 48 gateways processed just a single currency. So, if your business is planning to expand internationally, you should evaluate your options. Many businesses will have a significant market in their domestic currency and will have negotiated favorable arrangements with their payment gateway. They might then be concerned about giving that up in exchange for moving to a gateway that has broader international coverage. But that doesn't have to be a choice if you connect your application into multiple gateways. You can continue to transact in your preferred domestic provider and rely on another gateway for international transactions. If we narrow our analysis to focus on one currency, we can see more clearly how decline rates across different gateways compare. Focusing on USD as that currency makes the most sense, as we have 85 gateways in our sample set that transact in US Dollars. This also helps eliminate the variability that might come from a gateway concentrating on currencies that may have a higher average decline rate. We found by assessing these 85 payment gateways that the variance of decline rates was very high. This validates the importance of not simply assessing your gateway vendor and its performance, but to have flexibility in your approach. That might mean flexibility in different markets to take advantage of relative success rates. And it might also mean flexibility to work with a different gateway provider if your existing provider is not successfully transacting at the level you expect. We also found that if a payment gateway performs well in, say Malaysia, that does not necessarily suggest that it will be a top performer in Chile. This variability of which is the top performing gateway in a particular market is a compelling reason to work with multiple gateways in order to maximize the volume of successful transactions across markets. A similar challenge faces merchants around latency rates. This is the time required for a transaction to be completed. You can easily imagine the frustration that a consumer feels when there is a long latency to complete a transaction. They may assume something has gone wrong and abandon their cart. They may get frustrated and leave. Or they might remember the frustration the next time they select a vendor and simply go elsewhere. The reasons for latencies can have many sources, and just like declined transactions, many of these reasons are external to the payment gateway. However, there are many lessons that jump out from a comparison that mitigate this concern. Looking at the data, we can compare the performance of payment gateways across currencies. Here, much like for declines, we can see that gateways that have very low latency rates in one currency are seldom top performers in other currencies. That means that for a merchant to select a single gateways to service all the currencies they market in means frustrating a large proportion of their customer base. The chart here illustrates that point. 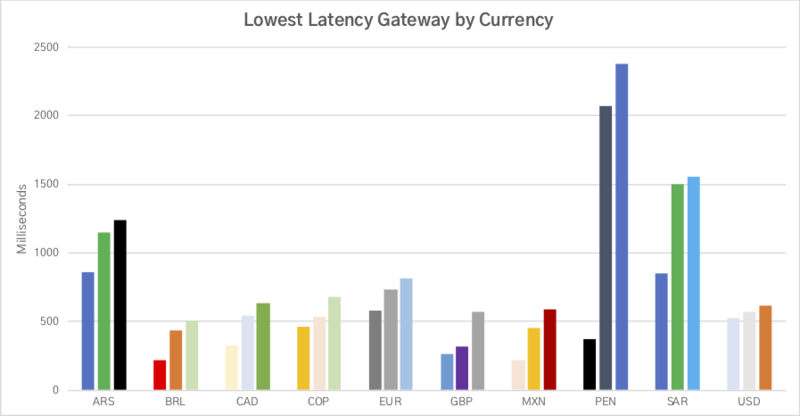 We've selected a basket of high-volume currencies, and identified the gateways with the lowest latency rates by currency in a sample of transactions. Then we marked each with its own color. You can immediately see the diversity of gateways across the top 3 across currencies. There is very little consistency, as a top performer in one currency is often not in the top 3 three for another. This becomes particularly challenging when you consider that your business is trying to expand into new markets. And if you move into the new market and provide a poor purchase experience for your customers, you‚Äôre less likely to gain traction in that geography. As your business grows internationally, you need to have the ability to accept payments in the regions where your customers are and where you want to sell. Without coverage, you set the bar very high for a customer to make a purchase. This challenge becomes even more apparent when you recognize that in our analysis we found thirty currencies that had a single gateway covering them. When looking at breadth of coverage across geographies, we found that the the average currency was supported by just three payment gateways. That suggests that a global strategy with one payment gateway can be difficult to manage because you may find that the currencies that you want to support are only covered by a basket of gateways versus a single provider. Again, by working with multiple gateways and selecting which to use for a particular currency gives you the flexibility to expand into the markets you want to target. Should I Choose One Gateway that Supports Multiple Currencies? As merchants expand internationally, their need to process payments in multiple currencies becomes essential. A valid approach for a merchant then is to select a payment gateway that supports the currencies needed. This may have some advantages, depending on the priorities of the merchant. But there are significant downsides that can have short-term and long-term impacts on revenue. As we discussed above, payment gateways differ in terms of their success rates and latency levels. This problem holds true even when looking at a single gateway‚Äôs performance across a basket of currencies. A gateway might perform well in terms of transaction success and latency times in one currency, but underperform in another. We see that in looking at the data below. Here we see a top performing gateway for Currency A radically underperforming for Currency B. This performance fluctuation will drag down revenue in the Currency B‚Äôs region for the merchant, as customers take their immediate purchase ‚Äî and long-term business ‚Äî elsewhere. This challenge can be addressed by implementing a basket of gateways. While latency and transaction success aren't the only determinants for which gateway a merchant should choose, they are important. By connecting with multiple gateways, a merchant can select and, when needed, rebalance a portfolio of gateways. Merchants can select which gateway makes the most sense for them for each currency. And then, if needed, move to another if performance erodes over time. While it is not the only consideration when evaluating which gateways to select, decline rates are an important factor. In our analysis, we compared the volumes of transactions for a given currency versus the decline rates experienced in that currency. We found that there often was a mismatch between the two. That is, the gateway with the lowest decline rate was infrequently the most popular. This again highlights the fact that companies choose their gateways for many reasons, not just decline rates. But can materially affect your revenue, and must be part of your calculus. After all, decline rates have a short term impact by reducing the amount of revenue generated for a given set of transactions. Plus, it affects the lifetime value of a customer because of their likelihood to not rely on your business in the future if they experience a decline. The analysis we ran compared the transaction success rate of the top performing gateway in our dataset for a particular currency versus the most popular payment gateway for that currency based on number of transactions in that currency. The results are striking. For some currencies, the gap is massive: up to 30%. But even in cases where the difference is small, imagine what that difference means to your business. What would 1% more successful transactions mean for your revenue and long-term relationship with your customers? By connecting to multiple payment gateways, you don't have to sacrifice one to the other. You can select the vendor you are most comfortable with from a business perspective and leverage better performing gateways where you benefit. The data is clear. Instead of reflexively relying on a single gateway, merchants should understand their business needs. Fast-growth companies in particular should evaluate whether the importance of business flexibility, and addressing latency, and transaction success matter to them. If so, a balanced portfolio of gateways can give you the opportunity to maximize successful transactions across different transaction types.